While some Sony Bravia TVs come Wi-Fi enabled, some others do not. 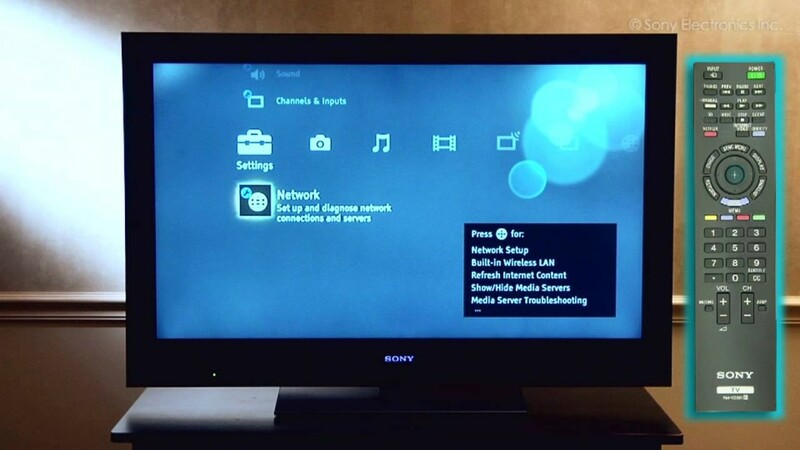 So if you are like me that got one that is not internet enabled and yet want to connect Sony Bravia TV to the internet, then this tutorial will teach you how you can make your Sony Bravia TV Wi-Fi enabled. If your Sony Bravia TV did not come with a built-in Wi-Fi adapter, then it cannot connect to the internet. Just like a PC without a network adapter cannot connect to the internet, so will your Sony Bravia not be able to connect without a network adapter. So if you are looking to connect Sony Bravia TV to the internet, then you have to first make it Wi-Fi enabled first. All you simply need to do is buy a USB wireless adapter to add Wi-Fi capability to your Sony Bravia TV. I don’t know if there are several wireless adapter that can work with Sony Bravia TV, but I am certain that Sony UWA-BR100 Wireless Adapter will work because it worked for me. The Sony USB Wi-Fi Adapter is sold for about $140 in Amazon. 1) Insert the Sony UWA-BR100 USB wireless adapter you purchased from Amazon or any other source into the USB port on the side of your Sony Bravia TV. 2) Turn on your Sony Bravia TV and press the “HOME” button on your remote control. 3) Select “Settings” and then “Network”. 4) Choose “Network Set-Up” and “View Network Status” and press the “Enter” button on your remote. 5) Then select “Wireless Set-Up” and then “Scan”. Your Sony Bravia TV will scan and list all available Wi-Fi networks within its range, select the network you want to connect to from the list and enter the network password if it is required. One of the selling features of a Sony Bravia TV is its ability to connect to the Internet and bring you additional content. Connecting your Sony Bravia to the Internet will allow you to use features that are not available on standard TVs, such as Internet videos and widgets. The features included with Bravia’s Internet television give you more options while watching TV. You can also stream multimedia contents from your PC, Tablet or even mobile to your Sony Bravia TV if you are connected to same Wi-Fi network. Now I can stream tons of movies from my laptop to my TV wirelessly or check something on the internet right from my TV. To be honest I don’t have any Bravia TV but I found this article very helpful so that I could get an exact idea of how to connect bravia to internet. You’ve shared really informative post. Isn’t this a cool thing to do? I’m just asking myself. Why didn’t I think about that. Though I too use a Sony Bravia TV which does have support for WiFi Adapter and DLNA included. It even has LAN port to connect directly to the Internet. And why the Sony adapter means, there would be no connection issue. To tell a trick. The adapter can also be attached to a laptop, so that it increases WiFi range of our laptop. The only downside is, it costs a whopping $150. This article is very informative. Many will not be knowing including me to connect SONY BRAVIA to internet.Your post throws an insight among us and now everyone who read your post will be aware of connecting BRAVIA to internet.Your steps are also crystal clear.My hearty thanks to you for sharing this. thanks for the post, i have always wanted to connect my TV to the internet, but i never took the time to browse the net for it, and the wirless adaptater you were talking about is a must to search wi-fi networks ryt. Yes except your Sony Bravia TV has an in-built wireless adapter.